As recently as 2010, the view of metabolic requirements for patients admitted to ICU was that all patients had the same metabolic needs and could therefore be managed with the same nutritional product. In general, critically ill patients were fed along the same lines as healthy people in the ratio of around 50% carbohydrates, 35% lipids and 15% protein. However, little benefit has been found from this approach or from the strategy of “temporary starvation” to patients in the ICU who cannot otherwise feed. During starvation, protein is often used as an energy source rather than as an anabolic precursor to muscle synthesis. In the absence of glucose there is a lack of substrate for the formation of pyruvate, which leads to a decrease in the uptake of protein into tissues. Instead dietary proteins are broken down into amino acids to provide an alternative energy source. The goal of medical nutrition therapy in the critically ill is to maximise anabolism, minimise catabolism and minimise oxidation of amino acids. The way in which patients are fed can have an impact on sugar levels and insulin infusion rates. In the EDEN study, 1000 adults with acute lung injury requiring mechanical ventilation were randomised to receive either trophic or full enteral feeding for the first 6 days.27 Although the feeding strategy had little effect on mortality, infectious complications and ventilator-free days, the trophic group had lower plasma glucose levels and required lower insulin infusion rates to achieve BG targets. While energy feeding in critically ill patients has been well studied, until recently little was known about early protein feeding. Insights were provided by a 2014 observational study with 843 mixed medical-surgical critically ill patients who required prolonged mechanical ventilation.28 Food intake and energy expenditure were closely monitored over four days. It was found that in non-septic, critically ill patients, early high protein intake was associated with lower mortality, and early energy over-feeding with higher mortality. In septic patients, early high protein intake had no beneficial effect on mortality. The first study to investigate the concept of permissive underfeeding evaluated the effect of restricting non-protein calories compared to standard enteral feeding in 894 critically ill adults while maintaining the full recommended amount of protein in both groups.29 There was no difference in any of the many clinical outcomes that were measured such as mortality, days free from mechanical ventilation, length of ICU stay and length of hospital stay. We have recently completed a study, as yet unpublished, to determine whether blood glucose control could be facilitated by using an enteral nutrition formula containing a low level of carbohydrates, lower medium chain triglycerides, and very high levels of hydrolysed whey protein, to ensure optimal protein delivery. The DIVINE study was an open label multi-centre randomised trial carried out at seven academic medical centres in the USA. It was planned to enrol 280 patients with the aim of 160 completing five days of enteral nutrition. The study ran for almost two years, from August 2014 through July 2016. Patients were included if they were mechanically ventilated, critically ill, obese or overweight (BMI 26 to 45), and required enteral nutrition for at least five days. Patients were excluded if they had liver failure, trauma or were planned for major surgery. A control group was fed a high protein formula with regular amounts of carbohydrate, and the intervention group had a very high protein, low carbohydrate formula. Both feeds had a caloric density of about 1kcal/ml, but the protein in the experimental group was about 50% higher at 92g/L while the carbohydrates were about a third lower at 76g/L, and the fat content was fairly similar in both groups at 38 and 34g/L. The aim was to deliver 1.5g/kg of ideal body weight per day of protein. The primary endpoint was the rate of glycaemic events in the first seven ICU days as defined by blood glucose levels outside the interval of 6.1 to 8.3mmol/L. Secondary endpoints included blood glucose, markers of nutritional status, urine and serum ketones, insulin and dextrose administered, and clinical outcomes. One hundred and five patients were randomised (53 control and 52 experimental) and 102 were included in the intention to treat (ITT) analysis. There were 51 patients in each arm. The groups were similar apart from a greater number of women in the control group. Regarding nutritional intake, the experimental group received significantly fewer calories and carbohydrates than the control group as planned, and both groups received about the same amount of protein. Over the seven days of the study, caloric intake was about 60% of the planned intake in both groups, and slightly more than 60% of the protein target, which was 1.2g/kg compared to the target of 1.5g/kg. Looking at the primary endpoint, there was no difference between the groups in the rate of glycaemic events outside of the intervals (6.1 to 8.3mmol/L). In the experimental group there was a higher rate of glycaemic events in the normal range of 4.4 to 6.1mmol/L but these are not defined as hypoglycaemic. In the same group there was a lower rate of marked hyperglycaemia (>8.3mmol/L). The mean glucose was lower in the experimental group by almost 1mmol/L (p=0.004). There was no difference in the rates of hypoglycaemia (<4.4mmol/L), and there was a smaller glycaemic dispersion in the experimental group (p=0.0015). There was a significant decrease of 11% in the frequency of insulin administration in the experimental group and there was no difference in the amount of rescue dextrose that had to be used. There was an increased frequency of abdominal distension in the experimental group, which may have been due to the formula and to intolerance of higher protein levels. Distension was considered to be related to the formula in one case in the control group and one in the experimental, which was withdrawn from one patient. Overall there was no difference between groups in the number of patients with adverse events. Mortality was not significantly different, but was numerically lower in the experimental group with two deaths (4%) compared to six (12%). 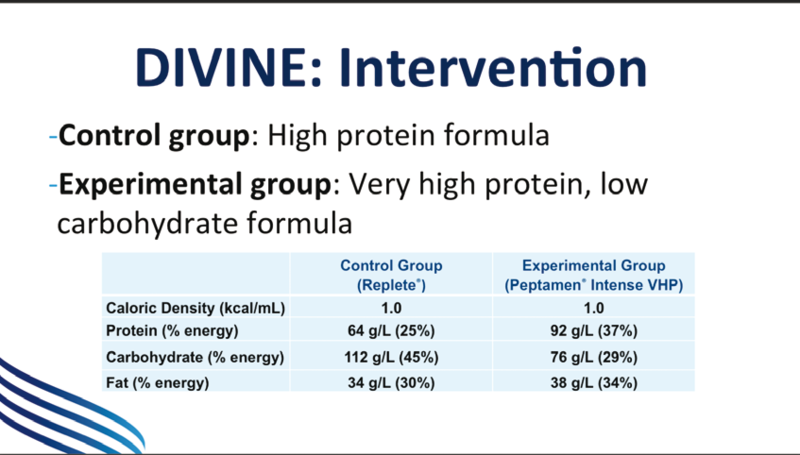 To conclude, in the DIVINE study a very high hydrolysed whey protein and low carbohydrate formula facilitated blood glucose control in critically overweight and obese patients. Although the formula did not reduce the incidence of blood sugar events outside the interval of 6.1 to 8.3mmol/L, it did lower the dispersion of blood glucose, resulted in a lower incidence of hyperglycaemia (>8.3mmol/L), increased the incidence of normoglycaemia and decreased insulin use without increased adverse events. 27. Rice TW. JAMA 2012;307:795-803. 28. Weijs P. Crit Care 2014;18:701. 29. Arabi YM. N Engl J Med 2015;372:2398-408. Medos customized tubing sets have been individually designed, so that all customer requirements, depending on application and need can be realized. Furthermore tubing sets can be refined by rheoparin or x.eed coating.